Next week, the 43rd Annual San Diego Comic-Con takes over the Bay Front and Gaslamp Districts of San Diego, California. The five-day long pop culture event features all of the geekiest wares in film, television, video games, and, of course, comic books. Although Disney will have a strong presence this year, their Marvel Studios is the only division that will take the stage of Hall H this year, with presentations for Thor: The Dark World, Captain America: The Winter Soldier, Guardians of the Galaxy, and maybe a surprise or two from the upcoming Phase Two or Phase Three. One noticeable absence from under the Disney corporate umbrella is Lucasfilm. Sorry convention-goers, no Star Wars: Episode VII this year. 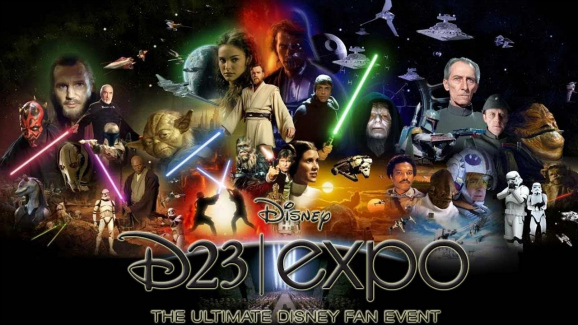 Instead, Disney, and the recently purchased Lucasfilm, are opting to take advantage of their own annual pop culture convention, D23 Expo, later this summer. Every August since 2011, the House of Mouse displays the very best they have to offer at their very own fan expo. In the past they’ve showcased new offerings from Pixar, The Muppets, Marvel, and now Lucasfilm. It makes sense for the studio to reveal exclusive news on the Episode VII front in their own house, rather than at Comic-Con. That way all of the focus is on them and their products, rather than spread thin over all of geekdom. So what can we expect to hear about Episode VII at D23 this year? According to THR’s sources inside Disney, we may see some legendary Star Wars actors. While no specific names were revealed, it’s believed that Mark Hamill, Harrison Ford, and Carrie Fisher all plan to hit the stage to confirm their involvement with the seventh Star Wars film. The original trio is expected to reprise their roles as Luke Skywalker, Han Solo, and Princess Leia, respectively. The MTV Movie Blog suggests that the cast of Episode VII could also be revealed at the annual event. That is certainly an appropriate stage for such an announcement. While there are no plot details about Episode VII, it has been widely rumored that it could involve the rise of the Solo Twins, Jaina and Jacen—the children of Han and Leia. The more actors that are revealed, during D23 or otherwise, the more clues we’ll have about potential storylines. At the very least, it seems like the perfect opportunity for Disney and Lucasfilm to reveal the new film’s official title. Presumably, Michael Arndt (Little Miss Sunshine, Toy Story 3) has finished the screenplay, with input from director J.J. Abrams (Star Trek Into Darkness), and creative and producing consultants Lawrence Kasdan (The Empire Strikes Back, Return of the Jedi) and Simon Kinberg (X-Men: Days of Future Past, Elysium). Any thoughts on what the new title would be? I liked Patton Oswalt’s suggestion, Star Wars: Episode VII – The Gauntlet Of Infinity. In the weeks leading up to D23 we should learn more about what they have up their sleeves. In the meantime, Disney is planning such Star Wars-centric events such as “Darth Vader: The Evolution of a Villain” and “Crash Course in the Force: Star Wars Saga 101.” Fans will certainly have these, and a ton of other great events to look forward to. D23 takes place from August 9-11 at the Anaheim Convention Center in Anaheim, California. Also expected to appear at the Expo this year are Disney’s new animated feature film Frozen, Pixar’s Cars spinoff Planes, and Marvel’s The Avengers.